Report “Your Health” includes blood tests to evaluate person’s overall health. 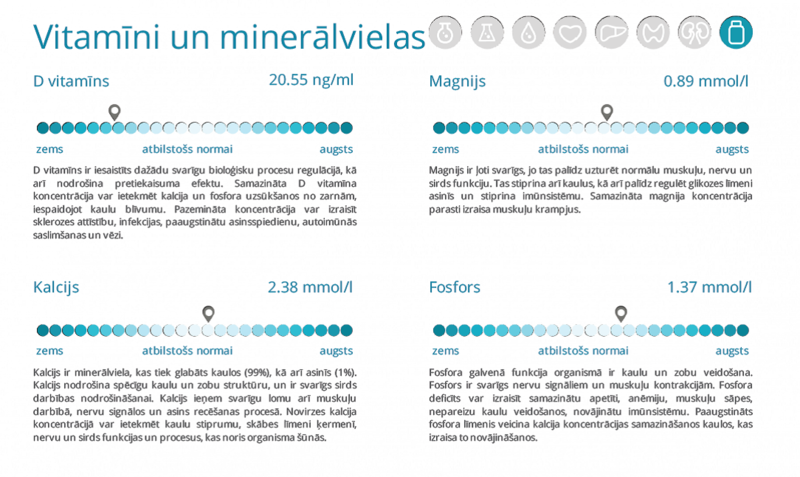 Blood parameters chosen in this panel help to assess general condition of Your heart, bones, thyroid gland, kidneys, liver and show Your general inflammation level. Identification of possible disturbances in sugar and lipid metabolism are also included. Most known blood parameters will be visualised with graphs and short explanation texts about particular marker. In this report we include complete blood count that is one of the most commonly ordered blood tests by doctors. This test measures the quantity of all the different types of blood cells and provides much more valuable information. Glucose and glycated haemoglobin show the condition of carbohydrates metabolism. Serum lipids and their ratios are added to check the health of blood vessels and cardiovascular system and lipid metabolism. Renal function tests help to evaluate kidney’s health and the body’s excretion ability. Biomarkers of digestive system/liver can be helpful to determine if liver is damaged. Possible disturbances with thyroid gland function is also included. Vitamin D with calcium is needed to assess your bones health. On the last page there’s a summary table with all test included in this panel. Results that stay outside the normal range are highlighted. The report comes with a description and conclusion of the results by laboratory doctor. Test results are ilustrated by color bars and clinical interpretation of each parameter is given. „Your Health” report price is EUR 54.00 and it includes the below stated parameters as well as results interpretation and visualization. The report comes with a description and conclusion of the results by laboratory doctor.